Судя по зарубежным комментам, является наградой за выполнение квеста Surprise Attack! в локации Танлунские степи. Описание квеста на ру.вовхеде пока что недоступно. Что бы получить финальные квесты у Шадо панов, нужно набить Равнодушие / Почтение с Золотым лотосом. Чтобы получить этого маунта, необходимо выполнить финальное задание Внезапная атака!, которое дается с превознесением у Шадо-Пан. Репутацию с этой фракцией можно начать зарабатывать после получения почтения у Золотой Лотос. раньше можно было лишнего сдать торговцу за внушительные 900г, но после патча эту радость отобрали, как и драконов выдаваемых по кв в дендрарии в общем то тоже. 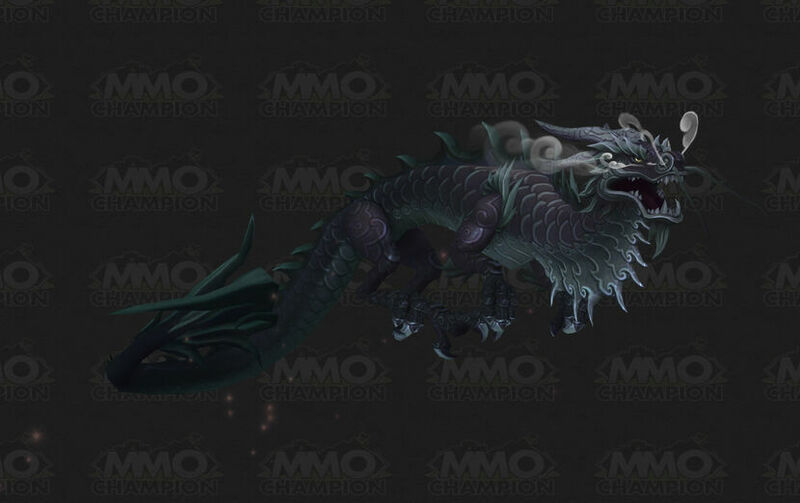 Reins of the Onyx Cloud Serpent and other Cloud Serpent mounts will be available like the Netherwings, through daily rep grinds, an other sources likes Profession quests, which can be started in Windless Isles towards the 'Order of the Wind Serpents' reputation. You pick the egg colour at the start, and help raise it, rather like the Venomhide raptor quests, though more flexible, and better and more entertaining quests. These mounts though won't be available until level 90. Rep Grinders start your engines. Mmm. Time to ride a big, black snake that goes very fast. I am LOVING this new style of dragon mount! So cool! I was getting tired of re-skins on drakes and dragons, but this one is really new and neat! This mount is a quest reward? Sick! Have to say, that's kind of awesome! Sure, it might be as ubiquitous as the Bronze Drake from Culling of Stratholme eventually, but it's still really cool that Blizzard is making at least one variation of this mount available to everyone. As someone who has most of the mounts in WoW, I don't think that's unreasonable, everybody pays to play the game and everybody should be able to enjoy a version of this gorgeous new mount! Words cannot describe just how badly I want this mount! Goden Lotus Revered is required as stated previously, to unlock Shado-Pan Dailies. Once Exalted with Shado-Pan, the quest to receive this mount will be unlocked. Order of the Cloud Serpent Exalted is required to ride these beautiful mounts. Should also point out, most people Zoned leveled to speedy level during week 1. I'd suggest completing as many quests as you can in Townlong Steppes. There are a few quests that give August Celestial Rep as well we Shado-Pan rep. Happy Mists of Dailydaria all! Im going to name him toothless. - Exalted with the Order of the Cloud Serpent to ride the mount. It's not Shadow-pan, it's Shado-pan everyone! The hardest "Not an over the top 1% drop rate grind" serpent, in my opinion. It requires everything from the previous serpents, plus another 2 factions of grinding. For the number of Onyx Eggs I've had to hand in to the Order of the Cloud Serpent, I'd better get one of the guys that hatched! Unlike how some of the mounts are now automatically added to your book, this mount will appear in your bags upon completion of the quest and you will need to click on it to add it to your list of mounts in your book. Revered with Golden Lotus no longer required. I dont know when they changed it. Got it on 29/6 2013. You can get this mount from fighting Huolon, a rare spawn in the Timeless Isle's north-east corner. Reins of the Thundering Ruby Cloud Serpent - Collect 10x Skyshard and Kill Alani <The Stormborn>(100% drop.) Note that you must be exalted with the August Celestials to learn it! I got this mount by accident >.< I wasn't even aware that it was a quest reward so I was pretty stoked to see it. Love the black color to it. If I were to obtain this mount via the Shado-Pan quest on a character that is not exalted with Order of the Cloud Serpent would I be able to LEARN it, as in right-click on it and it appear in my mount log, and then ride it on a character that is exalted? Or is it going to give me an error message saying "You do not have the required reputation with the cloud people to learn this mount" and I won't be able to learn it? It's significantly easier to get exalted status with OotCS than it is Shado-Pan, so I can always grind up the Cloud rep if it won't let me. But, I was hoping for an answer before I work on this if anyone has attempted to do this. After reaching exalted with Shado-Pan, I can confirm that it is possible to learn this mount on a character that is not exalted with OotCS then ride it on a character that is. I do not have any character exalted with OotCS, and I can still ride this mount. Got it today! Ive been farming shado-pan insignias but been gettin a lot of Golden Lotus stolen insignias as well.. So i got revered prety easy with both factions. Doin the Shado Pan daylies gives prety good rep as well... So i cant say if its needed or not Golden Lotus rep to get the quest. But i have zero rep with Order of the Cloud Serpent and i can ride this beauty! Just a slight correction on past comments! You do NOT have to have cloud serpant flying, I'm currently honored the the cloud serpants and cannot yet have their mounts, however this one I've learn and I'm flying all over pandaria! "Ониксовые облачные змеи агрессивнее и смелее, чем их небесные собратья."